The microstructure of polycrystalline ice evolves under prolonged deformation, leading to anisotropic patterns of crystal orientations. The response of this material to applied stresses is not adequately described by the ice flow relation most commonly used in large-scale ice sheet models – the Glen flow relation. 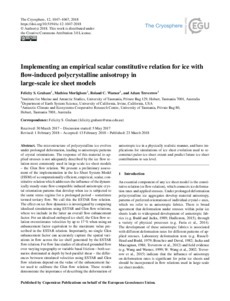 We present a preliminary assessment of the implementation in the Ice Sheet System Model (ISSM) of a computationally efficient, empirical, scalar, constitutive relation which addresses the influence of the dynamically steady-state flow-compatible induced anisotropic crystal orientation patterns that develop when ice is subjected to the same stress regime for a prolonged period – sometimes termed tertiary flow. We call this the ESTAR flow relation. The effect on ice flow dynamics is investigated by comparing idealised simulations using ESTAR and Glen flow relations, where we include in the latter an overall flow enhancement factor. For an idealised embayed ice shelf, the Glen flow relation overestimates velocities by up to 17% when using an enhancement factor equivalent to the maximum value prescribed in the ESTAR relation. Importantly, no single Glen enhancement factor can accurately capture the spatial variations in flow across the ice shelf generated by the ESTAR flow relation. For flow line studies of idealised grounded flow over varying topography or variable basal friction – both scenarios dominated at depth by bed-parallel shear – the differences between simulated velocities using ESTAR and Glen flow relations depend on the value of the enhancement factor used to calibrate the Glen flow relation. These results demonstrate the importance of describing the deformation of anisotropic ice in a physically realistic manner, and have implications for simulations of ice sheet evolution used to reconstruct paleo-ice sheet extent and predict future ice sheet contributions to sea level.